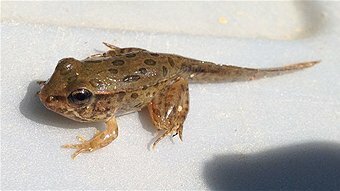 In a new study, southern leopard frogs (Lithobates sphenocephala) treated with an antibiotic cocktail which eliminated their skin microbes were more likely to be affected by the chytrid fungus, whereas frogs that maintained their normal skin microbes fared better against the fungus. Holden WM, Hanlon SM, Woodhams DC, Chappell TM, Wells HL, Glisson SM, McKenzie VJ, Knight R, Parris MJ, Rollins-Smith LA. (2015) Skin bacteria provide early protection for newly metamorphosed southern leopard frogs (Rana sphenocephala) against the frog-killing fungus, Batrachochytrium dendrobatidis. Biological Conservation, 187, 91-102.